-Rosie Mott presents part three in her series looking at teaching as a postdoc, including survey results from our recent poll. -Liisa Hantsoo covers the annual meeting of the National Postdoctoral Association – it’s an organization that supports biomed postdocs, and you can join for free as a Penn postdoc. Dear Doctor, You’ve Got a Hex on You! As a Psychology graduate student at Stanford in the 1990s, Elizabeth Newton did a study in which she assigned participants to one of two groups – tappers or listeners 1. Tappers were asked to pick a song most people would know, like “Happy Birthday,” and tap the rhythm of the song on a table. The listeners were to guess the song. Before the game began, Newton asked tappers what the odds were that the listeners would guess correctly. On average, they said 50%. Even that number seems low… Who in the world has not heard “happy birthday to you,” right? When the game got underway, it turned out that tappers greatly overestimated the odds, by about 40 times! How come? Turns out when a tapper tapped, he or she was hearing the song in his or her head. If you think about it, it’s impossible not to ‘hear’ the tune! Meanwhile, the listeners couldn’t hear that tune — all they could hear was a bunch of disconnected taps, like a kind of bizarre Morse Code. 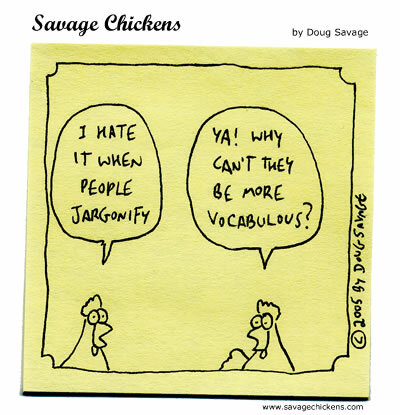 Ladies and gentlemen, meet communication’s enemy #1: the curse of knowledge. The knowledge that you, as a presenter, have – the information you know. Talking with that as your foundation just makes sense. After all, that is the knowledge you have acquired after much hard work! So why is that a curse? It’s a curse because once we know something, it is very difficult for us to imagine what it was like for us before we knew that. It’s a curse if I think you know everything I know and I talk to you in ways so that you can’t understand me. The worst part is that it’s a sneaky curse. No one sets out to intentionally let their knowledge become their barrier… but it happens to those who aren’t constantly aware of its presence and proactively trying to neutralize it. You have been on the receiving end of the curse! Has this happened to you? You talk to an IT guy about what could be wrong with your computer, only to realize his answer makes no sense to you. Or talk to a family member who bakes phenomenal pies and when you ask her for the recipe, her advice includes not-so-helpful instructions as “make sure the dough feels right.” If yes, then you have been at the receiving end of the curse. These individuals, like many others, are people whose instructions make perfect sense to them. Sadly, to their listeners, it sounds like disconnected taps! Even everyday conversations involving suggestions, jokes, feelings – all fall within the curse’s purview. In fact, anytime a miscommunication occurs, the curse is lurking nearby. The said misperception (or blunder, depending on the scale of damage inflicted) happened because someone communicated as if they themselves were in the audience. How your presentations become cursed? * “Basics”: it’s all relative! So, you start your presentation by “going over the basics.” Even when your audience is familiar with the topic – say when presenting to your lab – you must be careful. Just like the audience for those experimental subjects tapping out “happy birthday to you,” the majority still did not get that that was what the tapper was referring to. Is what’s “basic” to you as the presenter also “basic” to your audience? Are you tapping to them? It is kind of a “default setting” to speak in Expertise. The topic at hand is one we know very well. Much of our lives, our energy every day is spent steeped in those projects – planning, doing the experiments, troubleshooting, data analysis… so on and on, and on. So when we give a talk, we know what we mean. How frequently is that true for our audience? * Repetition does NOT prevent (or treat) the curse: You’ve heard this, I am sure: “Tell them what you’re going to tell them; tell them; and then remind what you’ve just told them.” Especially when it comes to scientific presentations, this is an oft-repeated sentiment, nay mantra, to learn the tricks of the trade. While not completely devoid of merit, the problem is that repetition is not the cure for the curse of knowledge. Instead, switching gears from speaking expertise to speaking “sticky” will win you the audience and their applause. The moral of the ‘tappers and listeners’ experiment is that we ought to have a universal language – one that is understood by audiences who aren’t as deep in the know about your research, that’s not littered with catch phrases whose meaning is privy only to a select few. In their book Made to Stick: Why Some Ideas Survive and Others Die 3, authors Chip Heath and Dan Heath outline six qualities that can transform how you convey your ideas, be it to your boss on the future directions of your project or to an audience gathered to hear you present a summary of your research. One quality is concreteness. Inevitably, a universal communication language would have to be concrete. Aesop’s fables are a remarkable example of truth made sticky because of the concrete mental images evoked in the listeners’ minds. The dismissive comment made by the fox about ‘sour grapes’ does far better than if he had worded it as ‘don’t be a bitter jerk when you fail.’ The message in both cases is the same, but its shelf life immensely different! Dr. Bonnie Bassler, a microbiologist, was featured in Science 4for the brilliance of her presentations. The word used to describe her presentations was “dazzling”. Seriously, can you picture it? A “dazzling” presentation and Hollywood is not involved! Among the tips she had for fellow scientists to make impactful presentations, Dr. Bassler shared, “These are detective stories with mini mysteries…” I found this a very powerful and practical way of incorporating stories into my presentations. It’s true, every experiment is a story! Investigating mysteries is an inseparable part of what we do. Why not give it more room on the stage, in our presentations? I hope that I have motivated you to incorporate stories in your presentations. I leave you with this cue from scientist-turned-filmmaker Randy Olson on HOW to include stories. Most scientific presentations follow a template he calls “and, and, and”: Here is a figure… AND here’s a graph… AND here’s another graph… AND here’s our conclusion. Dr. Olson offers a neat alternative, a new, improved plot line: And, But, Therefore. 1. Newton, L. (1990). Overconfidence in the communication of intent: heard and unheard melodies. Ph.D. Dissertation, Stanford University. 2. Heath, C., Heath, D. (2008). Made to Stick: Why Some Ideas Survive and Others Die. Random House, Inc. New York, NY. Many Penn postdocs feel they lack experience. When asked, “Do you feel as though you have enough teaching experience for your planned future?” only 27% of respondents felt confident in their training. From the survey, 40% claimed that they did not have adequate experience. Another 27% felt uncertain. Figure 1: Do you feel as though you have enough teaching experience for your planned future? In terms of actual skills, the majority of postdocs surveyed have performed tasks that are typical of a TA-ship during graduate school (77% have graded assignments/exams and 74% have lectured to a small group). After graduate school, postdocs see few opportunities to augment that experience beyond mentoring students in the lab. About 27% of postdocs have had the opportunity to design a full course, which many felt to be the most desirable form of experience. Lab supervision, lab course design and lecturing to a large group (>30 students) are other weak areas, with only 44%, 11%, and 42% respectively of those surveyed claiming experience. On the bright side, a majority (61%) has had the benefit of designing individual lectures. Many Penn postdocs feel that they cannot or do not know how to obtain more teaching experience. 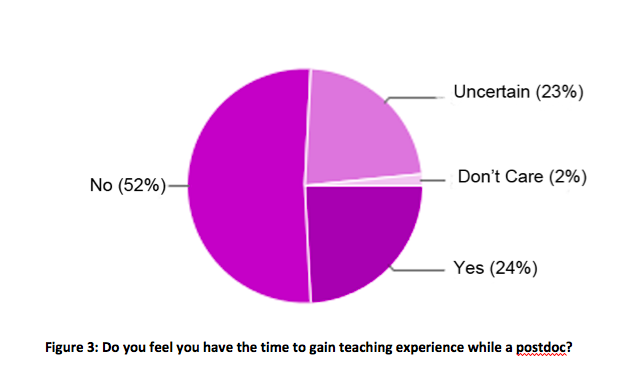 For the question, “If you wanted to gain more teaching experience, do you feel you have the resources to do so?” only 24% replied “Yes.” The largest cohort felt simply uncertain as to how to seek such experience. Figure 2: If you wanted to gain more teaching experience, do you feel you have the resources to do so? There’s never enough time. 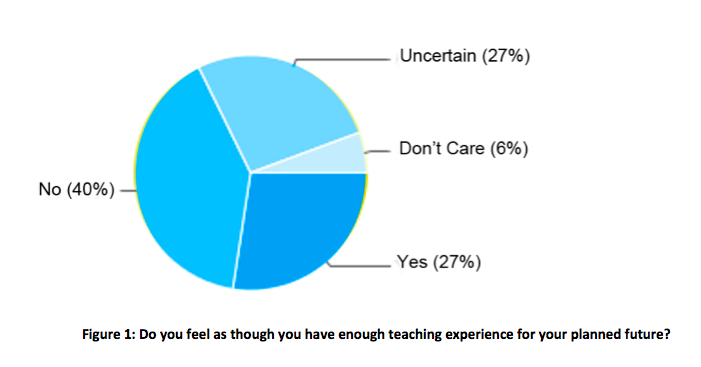 For all of the opinions expressed, “Do you feel you have the time to gain teaching experience while a postdoc,” generated the strongest majority with a resounding ‘No’ by 52% of survey respondents. We suspect that this is the root of the problem, as the postdoc’s duty to research does not allow the time needed for real teaching experience. Some respondents expressed that their postdoctoral advisors were not supportive of the endeavor; if an opportunity arose, it would need to be a night or weekend course. 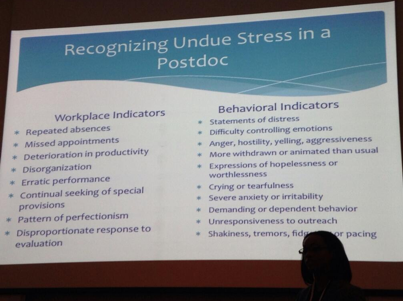 Figure 3: Do you feel you have the time to gain teaching experience while a postdoc? Thank you for all of your insightful comments on the topic. As it was a voluntary survey, there may be bias for sampling from postdocs that have strong feelings on the issue. At the end of the day, a more open dialogue could benefit postdocs who are worried about this aspect of their training. Through open discussion, fortuitous situations may present themselves to postdocs seeking the experience. Alternatively, Penn postdocs can push for a more formalized type of training to reduce the feelings of anxiety and to even the playing field. In the U.S., there are tens of thousands of postdocs1 scattered across hundreds of institutions2. How does such a dispersed group form a collective voice to advocate for itself, gain recognition and influence policy? Until relatively recently, this was difficult. However, in 2002 the National Postdoctoral Association (NPA) was formed. Now at over 2500 members, the NPA has been voicing postdocs’ concerns at the national level for over a decade with the overall aim to enhance the quality of the postdoctoral experience in the U.S.. It accomplishes this aim through three key areas: advocacy, resources, and community building. The NPA’s advocacy goal is to foster beneficial postdoctoral policies at universities across the US. 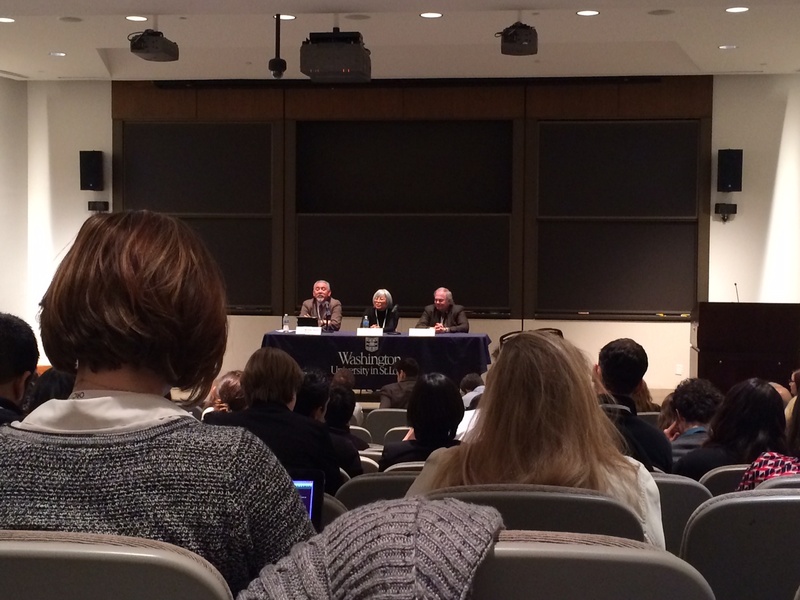 They often work with postdoctoral associations at universities, such as Penn’s Biomedical Postdoctoral Council (BPC). The association has laid out Recommended Practices that have been adopted by over 150 institutions nationwide. The NPA also works with federal agencies, such as the NIH and NSF to enhance postdoctoral training, benefits, and compensation. For instance, the NPA was among the advocates for NIH’s recent action to increase postdoctoral stipends. In terms of resources, the NPA has developed a number of informational guides for postdocs, available online. These cover topics such as career planning, responsible conduct of research, work-life issues such as maternity leave, a “Survival Guide for International Postdocs,” and financial concerns such as student loans. Finally, their community-building aim is achieved through an annual conference as well as regional meetings that allow postdocs to develop leadership skills and to network. The NPA’s annual meeting is the nexus of its efforts. The meeting provides a chance for attendees to gather information, network, and exchange ideas about issues relevant to postdocs. This year’s annual meeting, which occurred April 4-6 in St. Louis, included a keynote address, plenaries, workshops, and a poster session. Workshop topics were varied, and included topics ranging from “Communication Tips and Techniques to Enhance Your Leadership Skills” to “Mental Health Issues and the Postdoctoral Training Environment” to “Diversifying Your Career Path.” UPenn was represented at the annual NPA meeting by Laura Butler, Ph.D., a member of Penn’s Biomedical Postdoctoral Council, and by David Busch, a postdoc at CHOP. We caught up with Butler and Busch to get a closer look at this year’s meeting. NPA Meeting Plenary Speakers Drs. Sesna, Pond and Petsko. Image courtesy of nationalpostdoc.org. NPA Keynote Address by Susan Fitzpatrick. Image courtesy of nationalpostdoc.org. A presentation on NIH funding at the NPA Meeting. Image courtesy of nationalpostdoc.org. 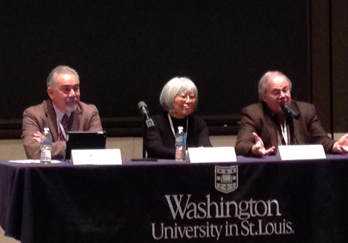 A panel on recognizing stress in a postdoc at the NPA Meeting. Image courtesy of nationalpostdoc.org. 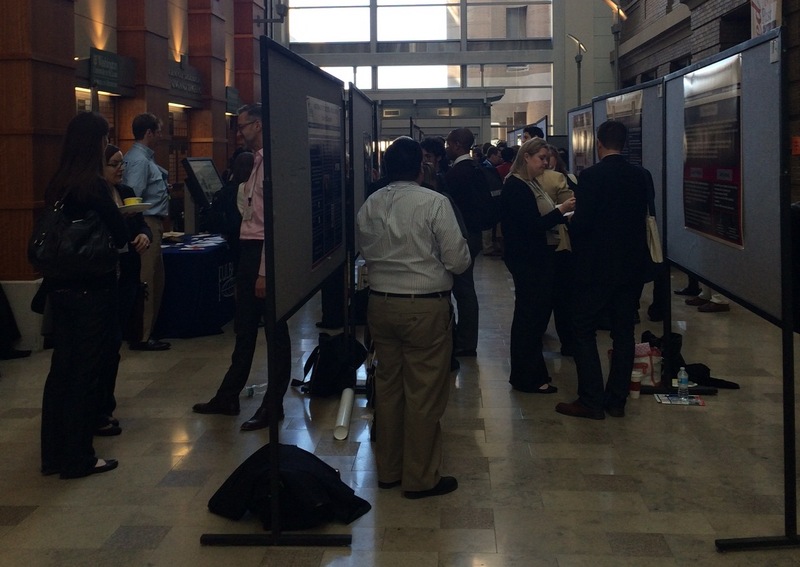 A poster session at the NPA Meeting. Photo Credit: Laura Butler. Butler said that one of the main themes of the meeting was the disparity between the number of postdocs and number of potential faculty positions. Discussions focused on the idea that “alternative careers” (outside of academia) are no longer alternative but more just “career options.” Busch echoed this, citing statistics that only about fifteen percent of current postdocs will succeed in tenure track jobs, and that the tenure track path may not be a reasonable expectation. Busch also summarized some of the NPA Advisory Committee’s recommendations to NIH, including requiring individual development plans (IDPs) on all NIH supported postdoc positions, and expanding National Research Service Award (NRSA) benefits. According to Busch, the NPA also recommended that the number of grants funded via the K99/R00 mechanism be doubled and the success rate brought up to 30%. He also noted that one of the NPA’s ongoing efforts is to boost retention of women postdocs. Plenary session at the NPA Meeting. Photo Credit: Laura Butler. Among the workshops and plenary sessions that Butler attended were “Diversifying Your Career Path” and “Post Doc, Ergo Doc?” Butler shared that the former enumerated transferable skills that postdocs possess: problem solving, communication, management, advising, ability to learn quickly, data processing, being detail oriented, and multitasking. The workshop highlighted how these are important in a wide range of careers, and encouraged postdocs to demonstrate to potential employers their skill in these areas. Other issues raised included the importance of networking. Panelists recommended using meetings and online communities (such as LinkedIn) to expand one’s network and gain recognition. “Using LinkedIn to reach out to people, even sending out emails “cold” asking for informational interviews were cited as useful ways of learning about particular career paths and industries,” said Butler. Panelists also emphasized that nurturing these connections, as they may be useful in the future, is important. In the plenary session “Post Doc, Ergo Doc?” issues were raised regarding the quality of care received by postdocs and low pay. Gregory Petsko from the National Academy of Arts and Sciences advocated a doubling of postdoc pay, suggesting that this would decrease lab sizes and allow better mentoring. 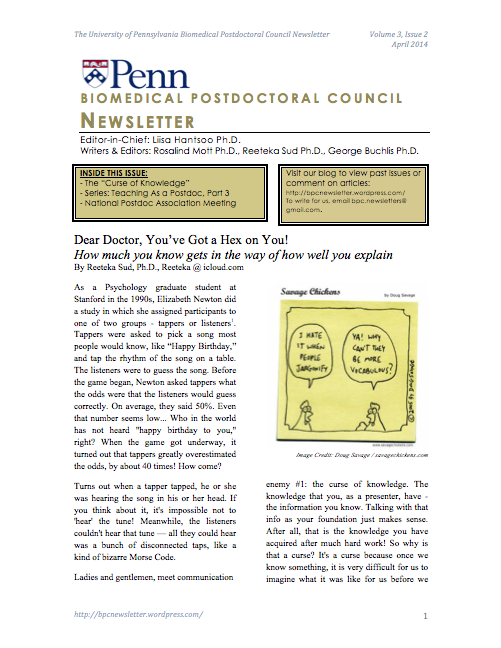 Butler explained that “[Petsko] believes that the increased competition for postdoc positions would lead to better quality science, eliminating the perceived need to have large labs in order to produce the quantity of work needed to publish in ‘boutique journals’.” Petsko also suggested that postdoc should not be viewed as a “default next step,” and that in his proposed system, PhDs might reconsider their career options, entering jobs more suited to them than postdoctoral research. In sum, both attendees described a good variety of talks, workshops and resources and ample opportunities for networking and socializing. The NPA meeting is held each spring; next year’s will be in Baltimore. 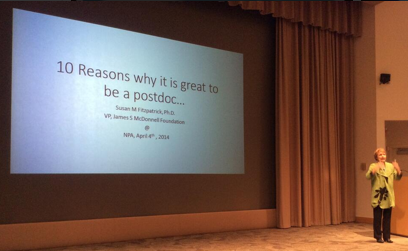 Registration will open in early 2015 at http://www.nationalpostdoc.org/meetings-and-events-4/annual-meeting. If you are interested in representing Penn at future NPA Meetings, please contact the Biomedical Postdoctoral Council (BPC). Snacks at the NPA Meeting. Which was in St. Louis. Not Philadelphia. 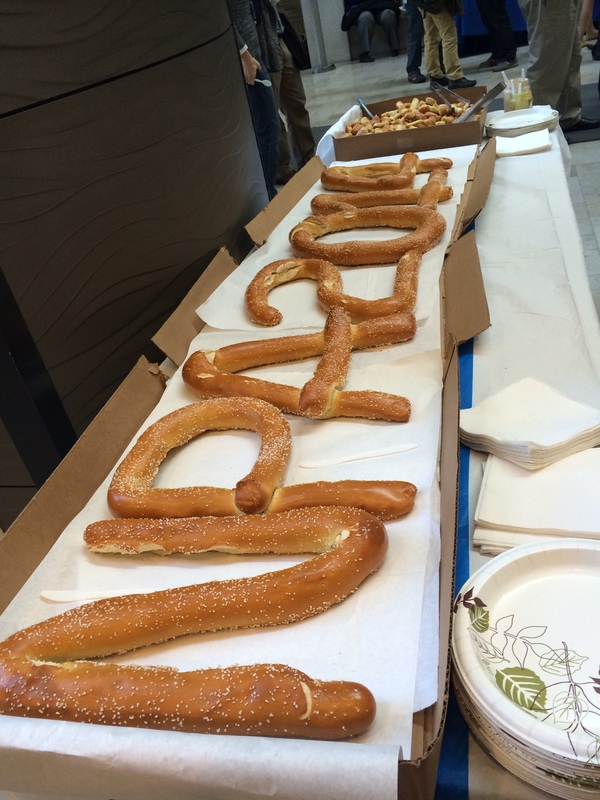 Despite the abundance of pretzels. Photo Credit: Laura Butler. (1) National Science Foundation Division of Science Resource Statistics. (January 2010). Science and Engineering Indicators 2010. Arlington, VA: National Science Board.